The paths we follow in life are rarely straight and without obstacles, and even with the vigor of youth socioeconomic responsibilities do more to shape one's future than a hobby. Sutee "PJ" Dismanopnarong started drag racing Hondas back in 2001 when there was no shortage of competitors and friends to race with, but as all stories begin they must too end. For PJ his drag racing days ceased when college took him out of the area and his friends moved on to other things. However, continued education didn't change PJ's love for cars and driving. Upon graduation PJ wanted to try a rear wheel drive platform but he couldn't shake his love for Hondas. 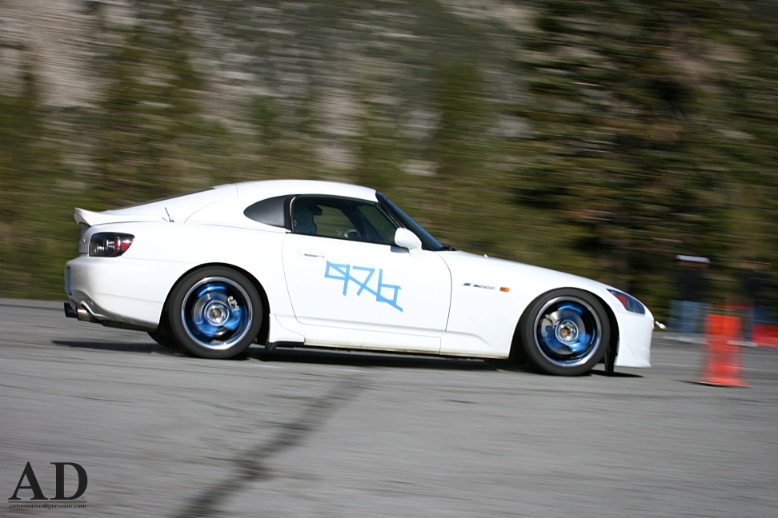 The S2000 was the obvious choice for PJ, but his desire for speed wasn't satiated by the stock F22C1's 237 hp. A Comptech Novi 1000 supercharger now does the breathing, and with a 2.8" pulley installed 13 psi of boost flows through the water-to-air aftercooler. Fuel is provided by RC Engineering 550cc injectors, reined by a 1:1 Aeromotive fuel pressure regulator, and exhaust gasses are expelled through a full Comptech exhaust system. Shad at Driving Ambition tuned the new forced induction setup with an AEM EMS to a very usable 386 horsepowers and 244 lb/ft of torques. "I actually wanted to drive on the track when I started, but I didn't know how to actually get started. So I found the local Autocross after talking with some [people] that have tried it, and it was my new love." -PJ D.
PJ and his S2000 at work. Knowing that he and his roadster would be spending many hours racing on Northern Nevada's hot tarmac the cooling system wasn't left to stock devices. A Koyo dual-core radiator was installed with a Mishimoto fan and shroud to keep coolant temperatures from getting dangerously high. An Earl's oil cooler and APR cooling plate were also added for extra insurance. Improving upon Honda's impressive High X-Bone Frame, rearward-mounted front engine rear wheel drive layout, with a factory 50:50 weight distribution isn't necessary to enjoy the S2000 or to race it, but some people can't leave things be. For more control over the damping, ride height, and alignment PJ upgraded from the stock suspension to Buddy Club Racing Spec Dampers. The blue 17x9 Super ADVAN Racing wheels are wrapped in 245/40 Dunlop Start Specs tires. Braking power and effectiveness have been increased with the use of Hawk HP+ brake pads, steel brake lines, and ATE Super Racing brake fluid. Interior mods are simple and purposeful. A Bride Zeta III seat holds PJ in place and an AEM wideband O2 gauge lets him keep an eye on the engine's air/fuel ratio. This is a well tuned and kept example of a street-legal weekend race car, and it gets used. Categories: "Autox", "Honda", "S2000", "Sutee PJ Dismanopnarong", "Words"